• In this 2008 self-portrait by artist Levi van Veluw, a lush green landscape with animals grazing becomes a literal part of the artist's body. But is it such a conceptual stretch? Human beings are made up of the same stuff as the rest of the plants and animals on this planet. We need sun and water and food, and we need a living, thriving, biologically diverse planet to be healthy, happy animals. Ecocide is simply a delayed form of mass-suicide, and while the machine of our culture destroys the very thing upon which we rely for everything, individuals should be asking radical questions of the fragile, detached bubbles we create to live in. Cities are illusions of permanence. Male identity - especially the American/Western male, is a major roadblock to sustainability where empathy, compassion and connectedness are rejected as symbols of weakness. Reflecting on the recent "Rapture" craze that took our attention in the last week, I think that it is critical to remember that we are of this world - our one and only home - and until we can each see our own bodies as parts of this home, as literal relatives of animals and trees and rivers and mountains, we will fail to be "saved" not from sin, but from our own delusions. • What the cluck? Please check out episode 71 of the Our Hen House podcast where the dynamic duo of Jasmin and Mariann interview me about almost everything under the sun! I love those ladies. 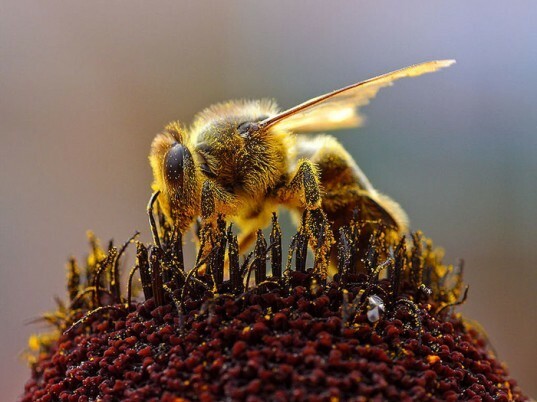 • It's Official- Cell Phones are Killing Bees, writes Inhabitat's Lori Zimmer. This poses quite a dilemma for ethical vegans and bug-lovers everywhere. If you abstain from beeswax and honey, is the next logical step to abstain from cell phones ? This is only one of the many conundrums that environmentalists and animal rights activists face living in consistency with their cause while very-necessarily participating in the modern world in order to bring about change. We depend on bees for survival - especially those of us who eat a plant-based diet. Without these super-pollinators plant-based agriculture would essentially collapse. "Research conducted in Lausanne, Switzerland has shown that the signal from cell phones not only confuses bees, but also may lead to their death. Over 83 experiments have yielded the same results. With virtually most of the population of the United States (and the rest of the world) owning cell phones, the impact has been greatly noticeable."